In my first substantive blog posted on this site, I spoke of my hope of finally getting a high-quality coffee maker out of the Black and Decker DE790B. I thought that the DE790B would make my coffee well into my thirties. I was wrong. The DE790B is dead. Not the decanter like the last two, though – she just stopped heating the water this morning. This means that I have killed three coffee makers since I started law school. Unbelievable. I will have purchased four coffee makers over a two-and-a-half year period. I would write more about this abomination, but I need to get to a coffee shop, and then a department store, so I can get a cup of coffee, a new coffee maker, and then get to studying. Normally, I am critical of my alma mater, Lakeview High School, pledging to send my children to private schools. Today I have altered my criticism, slightly. Lakeview Public Schools is a trendsetting district. For example, it, like the prestigious Bloomfield-Andover High, adopted a math curriculum known as Core Plus, developed by Western Michigan University. This program has been strongly criticized for its focus on “real-world” mathematics rather than more theoretical traditional math, and flat-lining ACT scores. Personally, I feel that I learned more about math in my advanced physics and chemistry courses than I did in Core Plus. My history program merely required a class on U.S. history, which almost exclusively tracked Howard Zinn’s (left-of-center) The People’s History of the United States’ section on the 20th Century. I learned a great deal about American Proxy imperialism and pre-Brown v. Board segregation. That was it. I did not learn what the magna carta was until I went to law school. I had simply not been told, and had no reason to find out for myself. Perplexingly, we were taught some ancient and world history in our English classes, of all places, but they myopically focused on the arts and humanities. For example, I can still pick Giotto’s Bell Tower, the Pantheon, and the “Pendulum Theory” out of a police lineup, if required. However, I left high school with no concise idea of how the Roman Empire fell, what caused World War I,* or why the United States was formed the way it was. Any graduate of Lakeview High School would know the error committed: the “imposing” columns of the Parthenon are not of the Corinthian order, but rather less ostentatious Doric columns. Corinthian columns are normally associated with the hedonistic Roman Empire, rather than the Humanistic Greeks, who preferred the austere Doric order. * Aside from the overstated crux of the assassination of Arch-Duke Ferdinand, which I learned independently. Normally, I like unhealthy cheeseburgers – when in Detroit, I have one of The Bronx Bar’s excellent swiss cheeseburgers once a week on average. With The Baconator, I found an exception. One of my coworkers, a vegetarian, was telling me about how her husband loves a sandwich called The Baconator, and how he would occasionally make late-night special trips to the particular fast-food restaurant that serves this abomination to order it. I was caught up in the name – it sounded funny, and I was hungry – so therefore I was sold. I ordered a Baconator, and washed it down with cheap coffee. It did not taste particularly good – certainly not good enough to justify the $4.00-plus price, but that was not what was terrible about the sandwich. I returned to work, and it was like curdled cheese and bacon fat were congealing in my brain. I could not think, focusing on my work became a struggle as a general malaise set in. I was lethargic, and felt as if I had just taken months off my life. I probably had, considering the nutritional value of the thing. 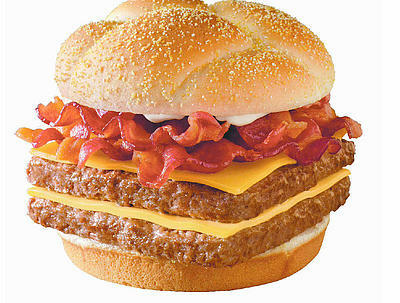 According to wikipedia‘s Baconator page, The Baconator weighs 553 grams, and contains 51 grams of fat. It does not take a mathematician to realize that this sandwich is approximately 10% pure fat. It has 840 calories, and 1 gram of dietary fiber, for that matter. In conclusion, I can only recommend that you, reader, not be sucked in – do not order The Baconator. One of the unique opportunities of being an intern in a prosecutor’s office is the distinct possibility of handling a jury trial. I was to have my first jury trial this Monday, but it was unfortunately pushed back until mid July. I anxiously await the chance to put the materials I have prepared to the test. Matters regarding the jury are now my concern every day. What will they believe? What won’t they? What can I say in front of the jury? What will get me a mistrial? Jury concerns have recently reached a new level of tedium. I am drafting a motion to exclude some evidence, and I was struck with the question of whether a jury is a “they” or an “it.” As in “the jury said they would not go to the beach,” or “the jury said it would not go to the beach.” Tense agreement and legal entities is a common grammar mistake regarding courts, i.e., a court is an “it,” not a “they,” which can be particularly confusing when appeals courts have multiple judges, and just seem, logically to be a “they,” not an “it.” An appeals court is an “it,” and after consulting with more than one individual in my office, we decided the same goes for juries. I recently received an unexpected opportunity regarding juries – the opportunity to serve on one. An eligibility survey came in the mail yesterday. I see this as a double-edged sword. On one hand, assuming I am not almost immediately the subject of a peremptory challenge, I could see the inner workings of the “black box” that is a jury. On the other, I will loose precious time that could be spent at my internship, thinking about how to argue to a jury from a lawyer’s perspective. Obviously, I have to serve if called, but I am not sure at this point whether I want to serve or not. Irrespective, I would probably get struck immediately, if I were to get into the voir dire (where the petit jury is decided by the parties to a trial). I am a law student, work in a prosecutor’s office, and worked in a civil law firm. If I were trying a case and had to choose to strike me or not, I would strike me, for risk that I would sway the jury. We will see if this actually happens. Last week I went to the Prosecuting Attorney’s Association of Michigan (PAAM) summer intern boot camp. This conference was intended to teach interns the basics of trial practice. The boot camp’s combination of lecture and trial exercises did successfully introduce me to trial in a way that was both entertaining and informative. One insight a Wayne County (contains Detroit) prosecutor shared when instructing was that direct and cross-examination are exercises in “herding cats.” This metaphor stuck in my head both for its humor, and for the fact that it soon proved itself to be true. Before becoming an intern at a prosecutor’s office, I imagined myself working in many capacities, but never as a cat wrangler. The PAAM exercises soon proved the metaphor correct. My witnesses made unexpected statements at inappropriate times, equivocated, shaded the truth, flat-out lied, and were generally difficult. At points, it felt like cross-examination resulted in making our cases worse, rather than impeaching the defendant’s credibility. And this was for good reason – we were questioning prosecutors with dozens of years of trial experience, acting out difficulty-prone fact patterns. The exercise taught us using some of the most difficult facts we could be exposed to this summer. Though I am certainly not yet proficient at cat herding, I have certainly laid good groundwork. I cannot wait until I can try it in the courtroom. His name is Stewart (Stu for short). I wanted to name him Farnsworth, after the treatise writer who helped me ace Contracts, but my [ex]girlfriend convinced me that this would be too nerdy, and thus, I settled on Stu. Puppy training is a very challenging and stimulating activity. I am convinced that dogs come into the world thinking that they can chew on 98% of what is in within their reach. Unfortunately, most dogs’ owners think that their dogs can only chew on a de minimus percentage of the animals’ environments: toys. I am constantly buying dog toys. I have the Kong Toy, which reminds me of a rounded-off version of the hats worn by the ’80s pop band Devo. I have the screen-printed cloth newspaper stuffed with cellophane and printed with doggie headlines (“Arf grr bark wine…” etc.). I have rawhide pigs ears and dozens of bones. None of these stop him from trying to eat my shoes, chew on my couch, and run around with the toilet brush, which I find particularly odd. Irrespective, he has still made this last month infinitely more fun. Already, having him around makes all the scolding, 5:00AM bathroom runs, and accidents worthwhile. I can’t wait until he is a fully-trained pointer. As of yesterday, I am 50% done with law school. This is great news. I go back to work tomorrow, but today, I sit idle for the first time in months. Last night, I went rock climbing for the first time in weeks. I walked around town, went to book stores, read magazines etc. etc. etc. If it were not December, and there were roses, I would have stopped and smelled them. People have claimed to me that the second year of law school is easier than the first year. I think they were squarely mistaken. The readings were longer, the concepts more difficult, and the curves were still there. Further, I had additional responsibilities: moot court, work, and interviewing all increased the challenge of the year. During 1L, I spent my weekends studying and getting ahead in readings. This first 2L semester, I spent my weekends writing moot court briefs, practicing arguments, preparing for interviews, and then catching up on all the housekeeping that I had neglected during the week; e.g. doing the dishes and laundry. It was impossible to study as much as I did last year. However, the challenge of the 2L year helps to refine another skill vital to a practicing attorney: time management, which is essential to practice, and just as essential to success in the 2L year. Looking back on them, I think that exams went well, and I look forward to seeing the results of another semester.